Bill and Ted’s Excellent Adventure is an online video slot machine game from Microgaming that was released in July 2008. This online video slot machine game has 3 reels and 5 pay lines. The theme of the game comes from the movie “Bill and Ted’s Excellent Adventure”, which was released in 1989. The movie is all about a time-travelling heavy-metal-crazy dim-witted slacker duo who sets off for an unforgettable adventure of their lives in order to pass their history class. The movie Bill and Ted’s Excellent Adventure was not exactly groundbreaking back then. The appeal of the movie came from the portrayal of two brainless teenagers starred by Keanu Reeves as Theodore “Ted” Logan and Alex Winters as Bill S. Preston, Esq. who wanted to become famous by forming a band called the ‘WyldStallyns’ even if none of them knew how to play any musical instruments. However, big problem awaits the two as both were about to flunk their history class unless they make up for it in their history presentation. Should they flunk their subject, Ted will be shipped to Alaska for military training. Fortunately for them, Rufus, a man from the future, came and provided them a time-travelling telephone booth which they can use to gather the data they need to pass their finals presentation. As they travelled back through time, instead of just gathering necessary information about historical figures, they kidnapped them and brought them to the present to help them with their report. All-in-all, the historical figures they kidnapped are: Napoleon Bonaparte, Billy the Kid, Socrates, Princess Elizabeth and Joanna, Sigmund Freud, Ludwig van Beethoven, Genghis Khan, Joan of Arc, and Abraham Lincoln. Although they encountered a few bits of trouble here and there, their presentation of the influential historical figures was met with great success. In the end, they not only passed their history class, but they also got the princesses. Microgaming online slot games are available to players in 2 formats – download and no-download. Whether you like to download their software first or you prefer to play instantly without the need to download, then Microgaming surely has online slot machine games to accommodate your every slot gaming preference. Good thing that Bill and Ted’s Excellent Adventure is available for instant play, so you do not have to download anything to find out if this game interests you in a way that you would like to spend some real money on it. Bill and Ted’s Excellent Adventure is created for those with “adventurous” souls who appreciate heavy-metal music, and also have the desire to win some real money while enjoying a round of spins in this slot game. Relive the historical finds of our two heroes in The Bill and Ted’s Excellent Adventure online video slot game which features cascading reels, stacked symbols, scatter symbols that can trigger the Circuits of Time Bonus Feature game, a randomly activated Guitar Bonus Feature game wherein you can have the chance to win up to a 2,000x multiplier value and WinSpins (Free Spins), and a maximum cash jackpot of $4,000! The quality of the graphics and sound that Microgaming delivers is absolutely great and top notch. They have a reputation of making the most stunning graphics and true-to-life sound effects that will truly transport you to “that specific theme” they used in any of their slot games. Most people love to play games incorporated with Microgaming software because they have smooth animation and engaging yet non-interfering sounds. In the Bill and Ted’s Excellent Adventure video slot game, the introduction starts off with the duo and Rufus telling the two that he will help them followed by some number pressing and a graphical presentation of a telephone booth travelling through time. The symbols that have been used in the game are pictures of Bill and Ted, Abraham Lincoln, Rufus, Genghis Khan, Napoleon Bonaparte, a telephone booth, the logo of their slot machine game, and the Wyld Stallyns name as the wild symbol in the game. When you first play the game, graphically, you will see familiar characters from the movie are presented. Realistically, the graphics of the game will bore you if you are used to playing slots with quality arts and graphics. Then again, it is the catchy almost hypnotic guitar riffs of the game that will keep you glued on to it and playing it. There are no card deck symbols available in the Bill and Ted’s Excellent Adventure online video slot game. The regular symbols that you will find in Bill and Ted’s Excellent Adventure are the Bill and Ted’s Excellent Adventure Logo, Napoleon, Genghis Khan, Abraham Lincoln, Rufus, and of course, Bill and Ted. The Wild Symbol is the Wyld Stallyns symbol. The Wyld Stallyns wild symbol acts as a substitute for other symbols (except for the Scatter symbol) in order to help you form winning combinations. When you are able to get winning combinations with multiple Wyld Stallyns wild symbols on an enabled pay line, you will be given varying prizes (refer to the Payout table). The Scatter Symbol is the Phone Box. The scatter symbol is not required to appear in a line (on an enabled pay line) for you to win. The Phone Box scatter symbol can be found scattered anywhere on the 5 reels, and you are able to form winning combinations as long as there are 3 or more Phone Box scatter symbols that appear. If you manage to get 3 or more Phone Box scatter symbols, you will trigger the Circuits of Time Bonus Feature game. Please take note that the Phone Box scatter symbols do not give out any winnings; however, these let you enter and play the Circuits of Time Bonus Feature game. If you manage to hit 3 Phone Box Bonus scatter symbols that can be found scattered anywhere on the reels, you will trigger the Circuits of Time Bonus Feature game. You can win a random amount of WinSpins (or Free Spins) while playing the Circuits of Time Bonus Feature game. In the Circuits of Time Bonus Feature game, you will fly across outer space and shoot planets. Every planet you shoot will gain you a certain number of WinSpins. You can decide which planets to shoot by choosing the “Manual Pilot” option, or you can let Bill and Ted do the shooting for you by choosing the “Auto Pilot” option. All of the WinSpins you reveal will be rewarded to you. The Circuits of Time Bonus Feature game cannot be re-triggered while playing the WinSpins. Your WinSpins (or Free Spins) will be spun automatically. Once the WinSpins (Free Spins) are done, you are taken back to the main Bill and Ted’s Excellent Adventure online slot game, and the winnings you’ve got from the bonus game will be included to your total win. The Guitar Bonus Feature game is actually triggered at random. Any spin or cascade in the main Bill and Ted’s Excellent Adventure online slot game can trigger the Guitar Bonus Feature game. In the Guitar Bonus Feature game, you can be rewarded a random amount of WinSpins (Free Spins). To play the Guitar Bonus Feature game, all you have to do is to press the spacebar on your keyboard whenever the lightning bolt icon appears on the guitar strings and hits that sweet spot. The game is entirely similar to Guitar Hero, only this one only requires you to press the spacebar on your keyboard. If you successfully press the spacebar at the right moment, you earn WinSpins. You can choose to play it yourself by selecting the “You Play” option, or you can let Rufus play for you by selecting the “Auto Play” option. When you get the WinSpins, they will be automatically played out, and your winnings will be included in the bonus win box. You can win up to a whopping 2,000x multiplier value while playing the WinSpins! 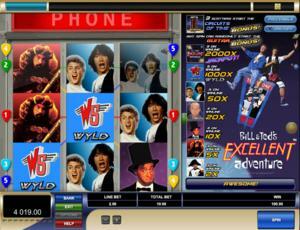 In the Bill and Ted’s Excellent Adventure online slot game, you get to enjoy their Cascading Reels feature. When you get to form winning combinations, the symbols in that winning combination will explode, and they will disappear just after you get paid your winnings. The symbols above the exploding symbols will shift position in order to fill out the emptied spaces made by the exploding symbols, thereby increasing your chances of winning. As long as there are winning combinations being formed, there will always be exploding symbols. Another thing that most people love about Bill and Ted’s Excellent Adventure slot game is that all of the symbols can appear stacked. It is entirely possible for up to three of identical symbols to appear on a reel simultaneously, which makes the symbols Stacked to each other. Stacked symbols absolutely increase your chances of winning. Please take note that only 1 winning combination is rewarded per pay line. Please take note that the amounts mentioned are in Pounds, but they will remain the same if you choose to play in US dollars, Euros, or Canadian dollars. Also, since the pay lines are permanently enabled or fixed in every spin, you cannot select or deselect the pay lines. The maximum payout in the standard Bill and Ted’s Excellent Adventure online video slot game is 2,000x the multiplier value on your overall bet. Bill and Ted’s Excellent Adventure is not equipped with an Autoplay function.